Originally a term created to outline the scope of music influenced by the continent of Africa, the term “Afro Roots” has become much more understood and defined as part of Africa’s modern music perspective. The concept of Afro Roots music is about the African past and its present; a genre morphed over time and constantly evolving. It is a genre stooped in tradition yet always open to outside influences thus creating a wide cross section of sounds. Afro Roots, just like Highlife and Afrobeat, represents and reintegrates globalized sounds of the Diaspora but revives and reinvents older, traditional sounds and instruments of Africa. The genre is influenced by sounds all over the world, but most notably the sound of the Caribbean and Latin America. Specific sounds, such as that of Soca, Reggae, Samba, Salsa, Mambo and Cumbia, are just a few of the musical styles that expand the Afro Roots style and are always evolving. It is, therefore, part of the evolution to reinvigorate African sound of the Diaspora but, most significantly, to restore the roots and traditions of Africa. It is easy to compare Afro Roots with other far-reaching music styles such as Highlife and Afrobeat that fuse and reinterpret Western musical styles with specific traditional, African rhythms. Highlife dance music retains a message of free expression and human experience originating in Ghana and Eastern Nigeria in the 1960s and based on the Kpanlogo rhythm. Afrobeat, a style that has also greatly influenced Afro Roots music, and led by musician and activist, Fela Kuti, fuses West African ostinato (musical chants and repetition) and rhythms with western Jazz, Funk and Rock styles. Looking specifically at Rocky’s own music, we can hear that he has been greatly influenced by these genres but Reggae is also a very prominent influence. Reggae is a musical style of rooted in political liberation and freedom. Reggae coincides with African communal tradition and is internationally recognized for its unique guitar chops, bass and drum sounds. 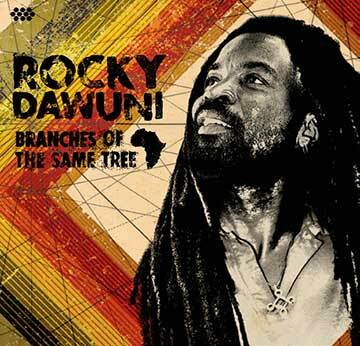 Alongside Reggae, Rocky’s music also incorporates American Funk and Soul further representing the fusion of sounds that Afro Roots has grown to encapsulate. The idea that music concerts can create mini communities, and build a certain connection, regardless of where everybody comes from, is something else Rocky has identified with the traditions and roots of African music, especially within tribal settings. The notion of a strong relationship between performer and the public is also a factor in the performance of Afro Roots. The full participation of the audience through movement and singing during a performance can be taken back to African traditions of healers or the West African Griots, praise singers, who act as regional historians and musicians, telling stories, and poems; singing, and entertaining, all with the means to communicate and inspire communities. Rocky’s album, Book of Changes, features a huge dimension of sounds. As well as using the traditional sounds, rhythms and patterns of various African tribes, the album features other traditional, melodic instruments such as the kora, a 21-string lute-bridge-harp, traditionally used by the praise singers to document the history of communities, played as a means to “interpret the deepest essence of the community.” There are different variations of the kora, such as the two string kora, which in Ghana is referred to as the molo, and used most by the Frafra peoples living in northern Ghana. The molo creates a unique and funky sound providing insight into the roots of Funk music. The molo gives us one example into the variation of traditional African instruments that can produce many different sounds adding further to our understanding of the Afro Roots genre. African instruments of this kind, assimilated with Western instruments, again, aid our understanding of the eclectic sounds of Afro Roots music. The rich history of Africa and its regional variations means that its traditional music alone is vast, but the music of the African Diaspora further accentuates how these traditions have helped create a never ending array of musical genres and sub categories. What Afro Roots provides is a strengthening of African musical traditions, retaining the simplicity, the heart of African music that everyone can, in some way, relate to. Afro Roots aims to reinterpret traditional African rhythms and instruments with the aim to remain holistic and widely accessible.